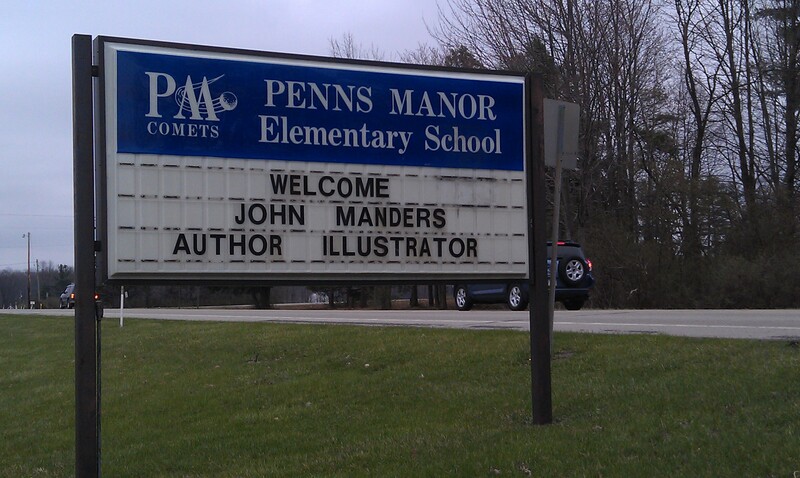 Many thanks to my hosts at Cranberry Elementary School! I hope everybody had as much fun as I did. I read The Perfect Nest since they are currently hatching some duck eggs. I painted a couple of pictures—a duck riding a unicorn and a pickle driving a tractor*—and got some great questions from the students. I even got to see my next-door neighbor! For the past week or so I had the great honor to give presentations to the students at Rowan Elementary School (who put a pirate ship in the middle of their library!) and Bedford Elementary School (whose walls are adorned with giant artworks created by the graduating classes through the years). Many thanks to my hosts/hostesses for inviting me and sharing my work with the kids. I was treated like a rock star and I’m grateful. I’ve sorta-kinda joked on this blog about saving Western Civilization. Even my motto reads: “Saving Western Civilization through kid’s book illustration.” And I’ve honestly meant to get started on that. I have, in a modest way, been promoting Western Civ by teaching Sunday School and posting some historical stuff here once in a while. I haven’t been very serious about that motto, though. But it’s a new year; a good time to get serious. Why does Western Civ need saving, anyway? We have Shakespeare and quantum physics and cell phones. We have crop rotation and the alphabet and Broadway. That’s good, right? Why can’t I just be happy? The problem is: I meet very few people who understand how we got Western Civ. There are too many people who think Western Civilization is not such a good thing, and is maybe an embarrassment, or should be apologized for. That way of thinking saddens me, if only because it’s so easy to point to how much human beings have benefited from Western Civilization. I think it’s important to understand how we’ve achieved all the things that we have. It’s important to recognize our incredible inheritance—gifts we’ve been given by amazing people who are long gone. Why were moveable type or symphonies or Greenwich Mean Time invented in the West? It’s vital for young people to understand how Western Civilization works, so that they may prosper in it. This is my mission. If I can’t save Western Civ, at least I can document her glories. I like history, so I’m going to be writing a history of Western Civ—particularly a history of ideas. I’ll post the stuff I’m writing here on this blog, as a way of test-marketing. My goal is to write and illustrate a book that presents the history of Western Civ in a fun format. You must know by now that I’m a smart-alec, so of course it will be funny. Lots of gags. Lots of pictures. I expect to learn and discover new info as I do the research. I invite you all to come with me. Jack and the Giant Barbecue has been nominated for a Reuben award! The January PSInside is here! And not a moment too soon! You can find it here. The new edition of PSInside just hit the newsstands!